Home » Blog » Our annual Easter Egg Hunt. This event is open to residents children or grandchildren and staff and their family. We have usually 40 to 50 children and stuff about 300 eggs. After the hunt everyone enjoys sitting on the Easter Bunny’s lap and snacks . 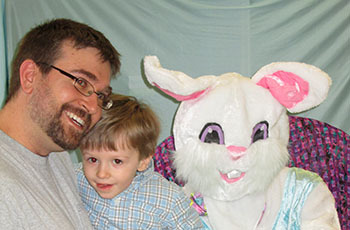 This is our physical therapist J. Balliet and his son and the Easter Bunny.